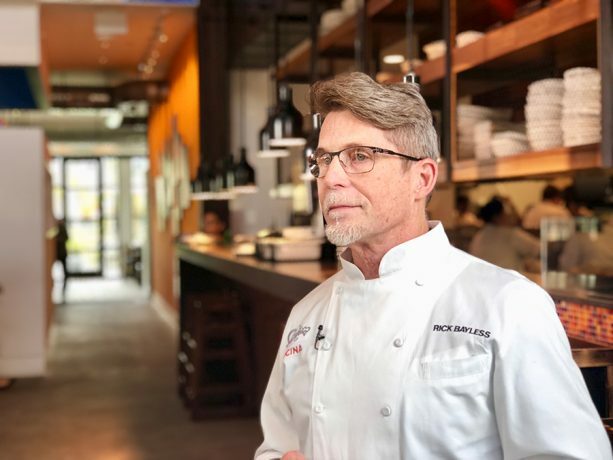 We caught up with Chef Rick at the restaurant, that recently debuted its Taste of Baja menu, which features five new items including Spicy Ahi Tuna Tostadas. It’s no secret that I love Mexican food. And when I’m in need of some the best Mexican food, I head over to Frontera Cocina by Rick Bayless at Disney Springs. And I visit as often as I can! The eight-time winner of the James Beard Foundation Award made the Tostadas for #DisneyFamilia in this fun video exclusive for us. Here is the video and recipe! In a blender or food processor, combine the mayonnaise and single canned chile. Pulse to combine, then process until thoroughly blended. In a medium bowl, combine the olive oil, powdered chipotle and ginger. With a sharp knife, cut the tuna into small dice—I like ¼-inch cubes—and scoop into a bowl. Finely dice the cucumber and the apple to the same size as tuna. Combine with the olive oil mixture and season with salt, usually about a generous ½ teaspoon. Refrigerate for about ½ hour for the flavors to mingle. Just before serving, stir the lime juice into the tuna mixture and taste. Adjust with more lime and salt if you think necessary. Smear a portion of the mayonnaise on each tostada, pile on a portion of the tuna mixture, sprinkle with flaked salt and decorate with cilantro leaves. Virtual Main Street will stream every day from park open to midnight (eastern).